Although the Olympics have now been and gone, for many athletes it will certainly be the games they will never forget. Here in Maven TM, we realised that some of our inside sales experts have a few traits in common with the athletes that took home gold. Preparation means you are constantly improving your skills to meet new and bigger challenges. For inside sales experts, preparation is key to prospecting. While doing lead generation, you need to spend some time researching about the contacts you are calling. Even more crucial, research the company itself. As a decision maker/buyer, there is nothing worse than receiving a call and knowing you were just another name on a list. Showing that you have made the effort to prepare prior to the call, will result in a more enhanced conversation. Olympians know that in order for them to win big, they need extreme commitment and severe determination. However, the failure in some can lie with not knowing when they are pushing themselves too hard. This may be through over training, for instance, causing them to burn out and potentially injuring themselves. A true Olympian knows when to ‘back down’. Just like a true inside sales expert. When engaging with prospect, knowing the difference between establishing problems they may have and offering a valid solution to it, rather then, pushing them to agree to your solution, regardless of the need, is crucial. Knowing when to take a step back, even if it means losing a lead or a ‘not so valid opportunity’ (or missing a training session or two) shows real skill. Combining optimism with integrity shows a person who seeks the best outcome possible in an honest and righteous manner. Both Olympians and Inside sales experts who have these traits are far likely to be more successful than a lying, cheating pessimistic. Inside sales people that keep positive and have an optimistic nature, are more likely to actively seek solutions to problems a prospect will have, will result in far more qualified (i.e. better) sales leads and in turn, happier customers. Those perhaps inexperienced sales professionals, who approach the engagement feeling they are going to fail but also promised the world to the prospect just to get them to agree to a follow up, may turn into a sale, but they will not remain a customer for long and your reputation will be tainted. Just like an Olympic runner, speed is critical, both in terms of the speed with which you make calls, so that you make enough calls to put yourself in a ‘good position’, and also when it comes to introducing your sales call to a prospect. Experts know there is only a small window of 15 seconds to introduce your product or services in a clear and concise manner to either make or break your prospects attention. Additionally, starting the call (or race!) on a fault may ruin your chances of a win – preparation, being mentally ‘ready’ and effective use of talent will be key here! Finally, Going for the Win! 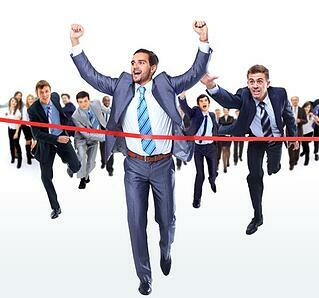 The feeling an athlete gets when he/she is the first to cross the finish line and break the ribbon is similar to when an inside sales expert gets a “yes, I would like to move forward” at the end of a call. It shows you have performed well, were the best in this particular competition and regardless of how many sales calls that buyer received, yours came up top. Making you a WINNER!